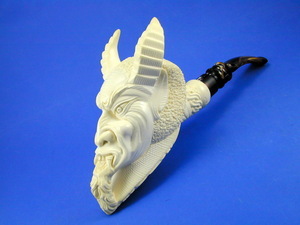 Dramatic carving of horned demon by Master Carver I. Baglan. L = 7.25 in. / 18.4 cm. H = 4.75 in. / 12.3cm. Depth = 1.7 in. / 4.3 cm. W = 2.25 in./ 5.7 cm. Weight = 3.5 oz. / 100 g.